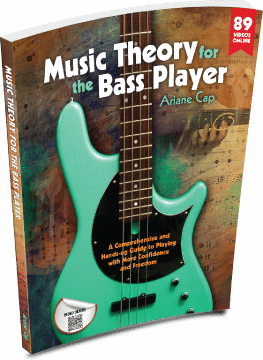 Music Theory for the Bass Player - the in depth course! Regular track. New material every other week, 20 units of instruction, monthly QAs, Ten payments. Ten months. 20 unit course: each unit featuring step-by-step guidance through the book and book videos, videos on finger kung fu (technique, including the popular "practice-with-me-sessions"), theory applications, bass line lab, fret board exercises (later styles study), and fun hip bits. Each unit comes with specific practicing tips, PDFs and background tracks. Lifetime access after last payment received. New content every other week in your inbox! Ari's Course in twice the time: for the motivated, pro-aspiring and ambitious learner. Commitment: 6 to 8 hours a week. New material every week, 20 units of instruction, monthly QAs, Five payments. Five months. Everything of Regular track, but new material delivered weekly. This is for ambitious and pro-aspiring players who know themselves well and are willing to commit to 6 or more hours of practice time each week. Includes personal coaching. Video correspondence course. For the learner who prefers guidance, coaching and feedback. The Course with personal coaching from Ari or Wolf. We give you homework based on your playing level. You send videos of yourself back as assigned for feedback, critique and the next steps for you. You can take as long as you like to step through the course with our guidance. If you'd like to continue coaching after five months of lessons the price drops to 99$ a month and you retain indefinite access to all materials of the course. Lifetime access after fifth payment received. Continued coaching optional for 99.00$ a month. Block of four. Redeemable forever. For specialized topics of your choice. With lesson notes and home work instructions after each lesson. Materials provided may include PDFs, back ground tracks and customized home work sheets. Block of 4 lessons each. Money refunded in full if you don't like your first lesson.